April 17, 2019, the Duluth HRA was awarded the ‘2019 Building Healthy Communities Award’ by Duluth LISC in recognition of courageous leadership in supportive housing and the transformation of the Esmond Building. At their Annual Meeting on January 29, 2019, the Board of Commissioners of the Duluth Housing & Redevelopment Authority (HRA) elected the following officers: Michael Talarico, Chair; Ann Glumac, Vice Chair; and Ron Boshey, Secretary. 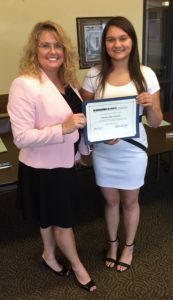 HRA Resident Awarded Minnesota NAHRO Scholarship! Natasha Gordon, an HRA resident who lives with her mother and sister in a scattered site property owned and managed by the HRA, was one of three state-wide winners of a $1,000 Minnesota Chapter of the National Association Officials (Minnesota NAHRO) Post-Secondary Scholarship award. Natasha was nominated by the Duluth HRA which is an agency member of Minnesota NAHRO. Jill Keppers (left), the Executive Director of the Duluth HRA, presented the award at the Duluth HRA Board of Commissioners meeting on May 29, 2018. Natasha will be graduating from Denfeld High School in June and will be attending the College of St. Scholastica this fall, majoring in Business. To place a call to a Minnesota Relay User, dial 7-1-1 or 1-800-627-3529.